Thales of Miletus lived in Ancient Greece. He was the first scientist in history. Thales looked for patterns in nature to explain the way the world worked rather than believing everything happened only because one of the Greek gods commanded it. He replaced superstitions with science. He was the first person to use deductive logic to find new results in geometry and, through requiring proof of theorems, took mathematics to a new, higher level. In general what we know of him was written hundreds of years after he lived, by Aristotle for example. When pronouncing his name, we say thail-eez, emphasizing the first syllable. There may have been other scientists before Thales, but if there were, we do not know their names. Thales was born into a privileged family in the ancient Greek city of Miletus in about the year 624 BC. His father’s name was Examyes and his mother’s name was Cleobuline. He was born in the same era as Aesop, famous for his fables. When Thales was born, Miletus was one of the wealthiest and most powerful of all the Greek cities. Today it is located on the coast of Turkey. Thales was born into a Greek society intellectually less advanced than those to its east and south – the Babylonians and the Ancient Egyptians for example. The Babylonians were masterful astronomers and mathematicians, while the Egyptians were also far ahead of the Greeks in these fields. In Egypt and Babylon, mathematics was used in commerce, astronomy, and construction projects. It was a thoroughly practical science. 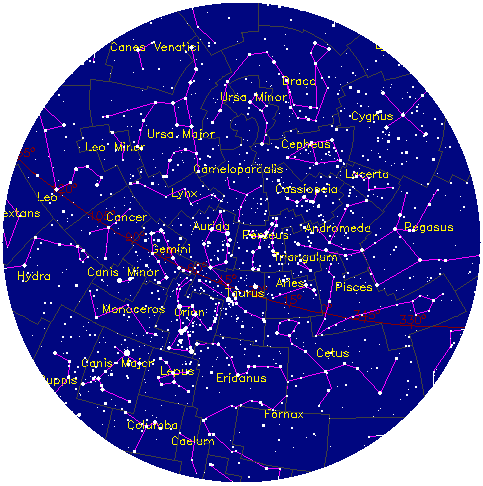 Astronomy was used to study the heavens to understand what the gods might be thinking. As a young man Thales became a merchant, which was probably his family’s line of business. In his later years Thales traveled to Egypt, where he learned about astronomy and mathematics. He may have traveled to Babylon; if he did, it would have been during the reign of Nebuchadnezzar. When Thales returned to Miletus he changed careers, took a big drop in income, and became Ancient Greece’s first scientist. Thales realized that natural phenomena had rational causes that could be studied and understood. For example, the annual flooding of the River Nile could be explained without Hapi, the river god, shown above. In Egypt the annual rise in the River Nile’s level was vital for the success of the Kingdom’s harvests. Every year the silty river would rise and replenish the land around it with nutrients and moisture. The river would then fall and Egyptians would farm the newly fertile land. Without the Nile there could be no Kingdom of Egypt, because rain hardly ever fell there. The Egyptians believed the Nile’s floods were caused by Hapi, one of their many gods. If the gods were displeased, the river would not flood, and there would be famine. The gods had to be kept happy at all costs. Thales said the Nile flooded for natural reasons, not because of Hapi. Nowadays, of course, we know the Nile floods because seasonal rains fall further south in Africa: in fact it was another Ancient Greek, Eratosthenes, who was the first to figure this out, although Thales himself seems to have speculated about the true cause. The switch between believing the gods were responsible for day-to-day events and believing that if we understood natural phenomena we could actually explain and predict events was Thales’ greatest achievement. It unleashed people’s ability to think about the underlying causes of what we observe. It was the first scientific thinking we know of: Thales was the man who dumped superstition in favor of science. A nerd with his head in the clouds who grew rich! Thales seems to have been Ancient Greece’s first ever academic – its first science nerd in fact! And he was mocked for it. In the wealthy city of Miletus people told Thales that no one could ever prosper from merely thinking, and that’s why he was not rich. Thales, however, proved his detractors wrong. He had studied weather patterns in the region of Ionia, where the city of Miletus was located. The weather patterns one winter indicated that next season’s olive harvest would be a bumper crop. While it was still winter he placed small deposits to hire all the olive presses in Miletus for the next harvest. In summer, when the olive growers began to realize that a huge crop of olives was coming, they discovered Thales had hired all the olive presses. Thales made a fortune by selling his rights to the presses to the olive growers. He carried out no physical work. He grew rich on mind power alone, applying his observations of weather patterns to predict how big the olive crop would be. He did not need any help from Aristaeus, the Greek god of olive groves. Ancient people believed earthquakes were a measure of their gods’ anger. Sacrifices, including human sacrifices in some cultures, became the normal way of trying to pacify angry gods. Ancient people believed earthquakes were a measure of their gods’ anger. Thales sought a rational explanation for earthquakes. He theorized that our whole planet Earth is a flat disk floating on an infinite sea of water and that earthquakes come when the planet is hit by a wave traveling through the water. With the benefit of modern science we know Thales got it wrong. 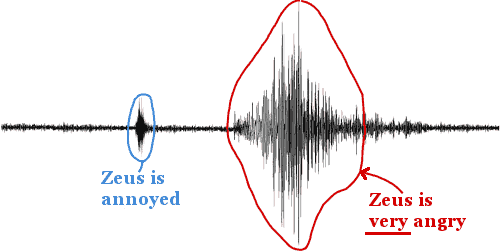 His theory was, however, an enormous advance on saying the earth shook because Zeus was annoyed about something. Thales had at least tried to find a rational explanation for earthquakes. A further benefit of Thales’ ideas (mercifully) was they required no sacrifices to be made. The Ancient Greek historian Plutarch, who lived 600 years after Thales, wrote that Egyptian priests claimed Thales’ “everything is water” theory originally came out of Egypt. Thales learned about astronomy in Egypt and possibly Babylon. The Romans also found a more basic globe showing the celestial sphere – a forerunner of the Antikythera Mechanism – which had first been made by Thales. Thales built a sphere showing the planets and stars in their constellations around Earth. Later Greeks – possibly Archimedes – developed this further and built a remarkably sophisticated heavenly calculator – the Antikythera Mechanism. As with astronomy, Thales learned about mathematics in Egypt and possibly Babylon. 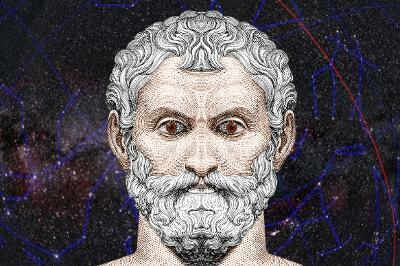 Back in Miletus, he built on what he had learned and was the first person to use deductive logic in mathematics, producing new results in geometry. He established for the first time that mathematical theorems require proof before they are accepted as true. Thales established the Milesian School, where he taught mathematics, setting the stage for mathematics to flourish in Ancient Greece. Thales did not reject the gods. He believed the gods were present in everything. As a result of this, all matter had some aspect of life in it. He thought that by understanding the fundamental principles of nature, people would actually get to know and understand their gods better. 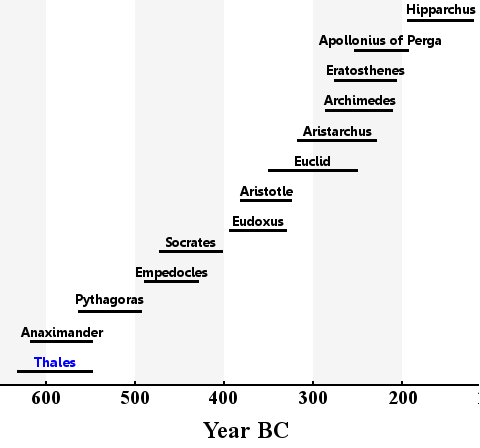 Thales was the founder of science in Ancient Greece. He established the Milesian School, which passed on his knowledge, most notably to Anaximander and Pythagoras. Greek science and mathematics peaked about 300 years later, in the era of Archimedes. The rediscovery of Ancient Greek knowledge was the spark that fired the Renaissance and Scientific Revolution in Europe, setting science on a course leading to our modern technological world. The rejection of superstition in favor of science began with Thales. Accounts from ancient historians disagree about whether Thales ever married. Some say he married and had a son. Others say that he did not marry, but treated one of his nephews as if he were his son. Thales died aged about 78 in about the year 546 BC. Images of Thales enhanced and colorized by this website. "Thales." Famous Scientists. famousscientists.org. 22 Jan. 2015. Web.